SMS Landing Pages are part of the Esendex Messaging Studio – our online platform which allows you to send rich message content to your customers and staff. What do we mean by rich message content? Anything that enhances a standard text-based experience – from images and call-to-action buttons all the way through to delivering digital receipts, re-arranging appointments and receiving payments. You are probably already accustomed to sending images, animated gifs, film clips and web pages through messaging applications like Apple iMessage, Facebook Messenger and WhatsApp. These were restricted to personal use (P2P), but they are starting to be opened up for business use (A2P, or application to person). Where is SMS in this ‘messaging revolution’? It’s worth noting that SMS is still the only messaging platform that will reach all mobile users, regardless of whether they have a smartphone or internet connection, and without the need to download an app. So there is plenty of life in SMS! However, there are two opportunities to get even more from SMS. 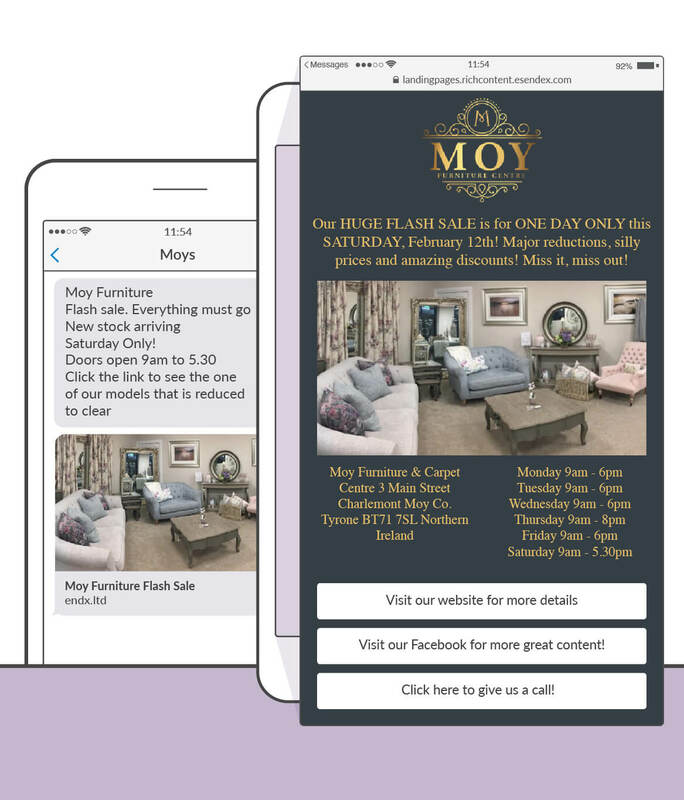 The first is to send an SMS Landing Page as part of your text message; this links off to a mobile web page that is specifically designed to get the recipient to take action (such as registering for an event, making a purchase, confirming an appointment etc.). The second leap forward for SMS is RCS (Rich Communication Services). This is designed to ultimately replace SMS as the default messaging app on Android phones, and will allow individuals and brands to send all manner of rich message content. How does Messaging Studio fit into all of this? The challenge with having multiple communication channels – SMS, Facebook, WhatsApp, RCS etc. – is that you could spend a lot of time crafting a rich message for one of these platforms, but find that if it is delivered to a different platform, it doesn’t look great – or doesn’t work. Our Messaging Studio is designed to allow you to create a rich message once, and then send it out via your choice of channels. Regardless of which channel you choose, your customers will receive a fully functional rich message. Landing Pages are the easiest way to introduce rich messaging to your communications strategy, as they can be viewed by anyone with a smartphone, and don’t require an app download. As you start to use Messaging Studio, you will see options to preview your messages as they would appear in RCS or as an SMS Landing Page. You can’t send RCS messages ‘by accident’, so if your intention is to send a Landing Page message, you can ignore the RCS view. If you’re ready to get started, head to https://studio.esendex.com.